Before using this information and the product it supports, read the information in “Notices” on page 19.
releases and modifications until otherwise indicated in new editions. 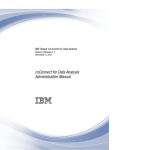 © Copyright IBM Corporation 1999, 2014. Install Client-Side Capture for Fiddler . . Fiddler download . . . . . . . . Install CSC plug-in for Fiddler . . . . Enabling remote connections . . . . .
Configuring the Tealeaf Target Page . . .
application target to TeaLeafTarget.php . .
Acquire Fiddler . . . . . . . . . . Acquiring latest versions . . . . . . . Installing or upgrading . . . . . . .
Configure Fiddler. . . . . . . . .
Configure Client-Side Capture . . . . Managing IPv6 addresses . . . . . . Performing a Client-Side Capture . . . .
Usage notes . . . . . . . . . . .
Cleansing captured sessions . . . . .
Configuring browsers to use Fiddler . . .
Auto-configure for most browsers . . .
Configuring Firefox to use Fiddler . . . Using Fiddler with secure sites . . . . .
References . . . . . . . . . . . . Trademarks . . . . . . .
more information, contact Tealeaf Customer Support . capture of all HTTP traffic passing through Fiddler to your local hard disk drive. This tool is useful for debugging capture issues while enabling access to Fiddler. browser tool, which is no longer supported. Fiddler with mobile devices,” on page 15. Client-Side Capture plug-in, contact Tealeaf Customer Support . SAZ format and submitting to Tealeaf for review. 1. Extract the .zip file that contains the plug-in (FiddlerCSC.dll). 2. Copy the .dll to the Scripts directory inside the Fiddler installation directory. 3. Launch Fiddler. TeaLeaf CSC should appear on the menu bar. 1. Click the status bar. Verify that the capture mode is set to Web Browsers. 2. In the menu, select File > Capture Traffic. 3. In the menu, select Rules > Hide HTTPS Connects if it is not already selected. Enter the directory location for .tla files. after which to insert the Tealeaf.js. v You may enter a regular expression to specify this location. request that is only based on the settings below. tealeaf.js into pages that cannot properly contain it. should not, however, install it within Fiddler directory. into which to inject the tealeaf.js file in your Fiddler browsing session. v If this option is empty, tealeaf.js injection is disabled. page data that is otherwise cached by the browser. eliminates the creation of unnecessary .saz files. Note: To apply some of these changes, you must restart Fiddler. mousedown event, complete the following configuration. 6. Close and reopen Fiddler. Note: IP addresses that are in native IPv4 format are not modified. 2. In the Fiddler2 menu, select Tools > Fiddler Options?. 3. The options window is displayed. Click the General tab. 4. Select the Enable IPv6 (if available) option. Select the Allow remote computers to connect option. use Fiddler” on page 13. 1. To begin capturing a session, you should first clear the browser cache. Client-Side Capture” on page 5.
the following options and click Delete. Recent History tab, select the following options and click Clear Now. 3. From the File menu, verify that Capture Traffic was selected. pages. Verify that Fiddler is able to see the pages you want to capture. 5. When you are finished browsing, close the browser and return to Fiddler. file in a location of your choice. UI events was captured correctly. using the Save all hits to TLA option in Fiddler. the capture mode in the status bar is set to Web Browsers. – See “Configure Fiddler” on page 2.
available, Replay Server fails to render the hit. pipelines in Tealeaf. If you have questions, contact Tealeaf Customer Support . v See "Privacy Session Agent" in the IBM Tealeaf CX Configuration Manual. Tester Utility, where you can test if your rule works. See "Privacy Tester Utility"
in the IBM Tealeaf CX Configuration Manual. the IBM Tealeaf CX Configuration Manual. v See "Archive Session Agent" in the IBM Tealeaf CX Configuration Manual. The resulting TLA was purged of references to non-primary domains. use Fiddler when Fiddler is configured to capture traffic. Note: For Opera, you must start Fiddler before starting the browser. Note: These steps may vary depending on your version of the browser. 2. Click the Copy Browser Proxy Configuration URL link. 3. Select the following in the Firefox menu: Tools > Options > Advanced. 6. Select Automatic proxy configuration URL. 7. Paste the link in the text box. When using Fiddler with a secure site, the browser displays a certificate warning. For more documentation on Fiddler, see http://www.fiddler2.com/Fiddler/help. from mobile devices using Client-Side Capture. “Using Client-Side Capture for Fiddler,” on page 1. See Chapter 1, “Using Client-Side Capture for Fiddler,” on page 1.
configured to use a remote connection. 1. In the Fiddler menu, select Tools > Fiddler Options > Connections Tab. 2. On this tab, select the Allow remote computers to connect check box. 3. Restart Fiddler for all the settings to take effect. c. Browse to any website. d. The HTTP traffic should be captured by Fiddler. computer name or IP address) and the port number. 2. Verify that the proxy is configured correctly by using Safari to browse the web. WiFi > <WiFi Network IDHTTP Proxy > Manual. running your application on the sim or device. 1. Identify a server that is accessible to your application. available for aspx, jsp, and php application servers. 3. Deploy the target page on the server. Note its URL. 4. Test the deployment by accessing the URL through your browser. Session) add the following code and save the file. Android Logging Framework Reference Guide. operation of any non-IBM product, program, or service. BUSINESS MACHINES CORPORATION PROVIDES THIS PUBLICATION "AS IS"
certain transactions, therefore, this statement may not apply to you. This information could include technical inaccuracies or typographical errors. publication at any time without notice. product and use of those Web sites is at your own risk. believes appropriate without incurring any obligation to you. including in some cases, payment of a fee. should verify the applicable data for their specific environment. those products, their published announcements or other publicly available sources. performance, compatibility or any other claims related to non-IBM products. withdrawal without notice, and represent goals and objectives only. liable for any damages arising out of your use of the sample programs. International Business Machines Corp., registered in many jurisdictions worldwide. Other product and service names might be trademarks of IBM or other companies. disabling them will also eliminate the functionality they enable. requirements for providing notice and consent where appropriate.